﻿ Real Madrid 6-0 Villlarreal. Gareth Bale makes a statement! 12.05.2018 » Real Madrid 6-0 Celta de Vigo. Gareth Bale makes a statement! 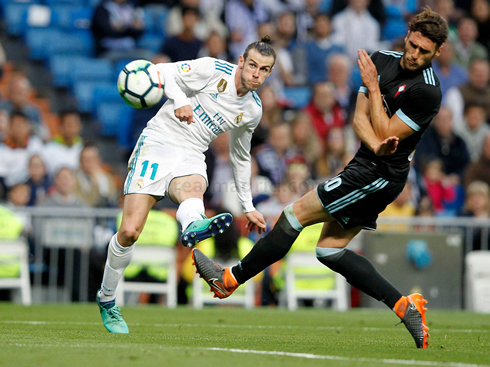 Real Madrid ran over Celta de Vigo this Saturday night at the Bernabéu in a 6-0 beating, with goals from Gareth Bale, Isco, Achraf and Toni Kroos. With one fixture left in La Liga, the Merengues are set to finish 3rd in the league, behind Barcelona and Atletico Madrid. Real Madrid won their league game 6-0 this Saturday night against Celta de Vigo and are now sitting in 3rd place 3 points behind Atletico Madrid and 5 points above Valencia. Cristiano Ronaldo was once again rested as he continues recovering from a small ankle injury, but unlike what happened in midweek, this time Zidane played a quite stronge lineup and got the result he was certainly looking for. The star of the night was Gareth Bale, who scored the first 2 goals of the game still inside the first half. Madrid hadn't won a game by at least a 2-goal margin since April 3, when they defeated Juventus in Turin by 3 goals to nil. More performances like this and perhaps we would have had a better league season. 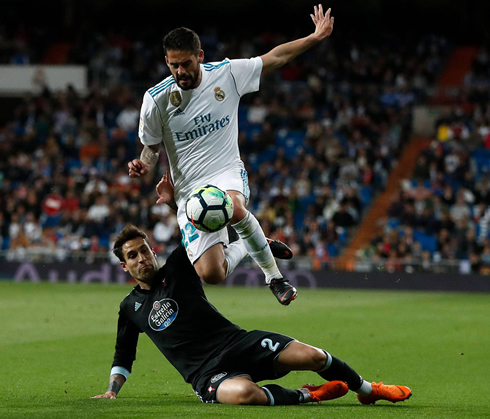 After the disappointing loss on the midweek, Real Madrid opted to play a full-strength side and found themselves easily dispatching of Celta de Vigo at the Bernabéu tonight. The star of the show was undoubtedly Gareth Bale, who put forth a performance worthy of Zidane's attention. His goals and his overall play as proved that his fitness is not in question, leaving Zidane with a massive decision to make ahead of the Champions League final. It was a through ball from Modric that freed the Welshman for his first, but the second was a thing of beauty. Lead down the flank chasing a pass, Bale was able to pick up the ball at the byline, cut right past his marker into the box and unleash a firecracker of a curling strike into the top corner. It was a sublime individual goal, the type of goal Bale was initially purchased for. More goals came. Isco tried to one-up Bale with a goal of his own, curling a shot into the top corner. Later in the game, Achraf, Kroos and an own goal from the visitors would cap off a prolific night. Villarreal is next, the last game of the season now serving as nothing more but a warm-up for Madrid. Cristiano Ronaldo should be back and Zidane will likely play him for at least 45 mins so he can keep his fitness up. All eyes now point to the battle between Isco and Bale for the final starting position. But Zidane has surprised us before so don't be shocked if we see both players on the bench with the likes of Lucas Vasquez and Marco Asensio. A lot of tough decisions ahead for the Frenchman, but can be happy with a job well done today. Attackers: Isco, Gareth Bale, Benzema. Cristiano Ronaldo next game for Real Madrid is on May 19 of 2018 against Villarreal. You can watch Juventus live stream, Villarreal vs Real Madrid, Levante vs Barcelona, Chelsea vs Manchester United, AS Roma vs Juventus, and Bayern Munich vs Eintracht Frankfurt, all matches provided from our football live game pages.